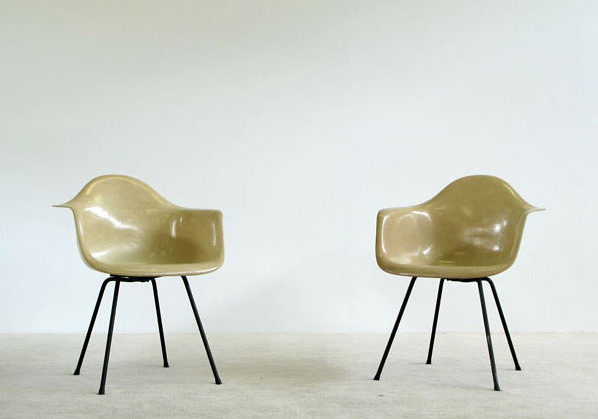 Pair of early Zenith Plastics Charles Eames DAX fiberglass shell chairs. 2 chairs in moulded fiberglass polyester seat shell, color parchment. Large shock mounts with metal black X base and new glides. Manufactured by Zenith Plastics, label has been removed. Paires de chaises en fibre de verre, Charles Eames DAX, production Zenith Plastics. 2 chaises en polyester, couleur parchemin. Structure d'origine en métal noir et nouveaux embouts des pieds. Construit par Zenith Plastics, étiquette n'est plus sur la chaise.